Finding keywords for your website can be a difficult process and often its the “easy” keywords that are almost impossible to rank well for. In other words; if you sell swimming pools its not hard to consider “swimming pool” as a keyword to optimize your website for. Problem is “swimming pools” is a very generic and broad search phrase. It may be easy to type into your website copy but how much chance do you have of actually ranking well for it? Even if you do, will it deliver quality traffic or quantity traffic? Not that broad generic terms (often referred to as short tail search terms or Head terms) are not important key words to have in your website, they are. What’s important to understand is how people interact with search engines and how that interaction relates to your website. Let’s say you are in the retail industry selling shoes. It’s not difficult to consider keywords like “shoes” or ” buy shoes online” when researching keywords for your website, but it’s important to know that generic keywords have very high competition making them very expensive and time consuming to rank well for. 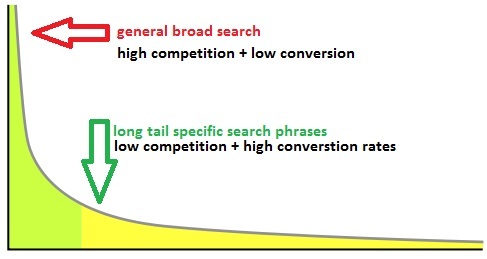 So what is a long tail keyword and how do you use it? 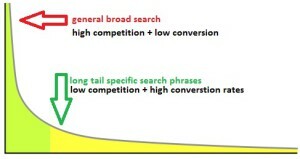 Long tail keywords are generally much more specific and often up to 5 words. They deliver much less traffic than the generic short tail keywords but the traffic is much more relevant to the search query entered by the searcher. Because long tail keywords are laser specific they often match search queries of people who are further into the buying cycle which leads to higher conversion rates. Lets take a pet shop as an example; the owner wants to sell items online. How much traffic would the term “fish tanks” generate for his website? If it ranks high in search results probably a truck load but how much of that traffic would convert into a sale and would it justify the amount of time, money and effort spent to get it there? In contrast a very specific search term like “compare prices whisper aquarium fish tanks” will deliver much less traffic yet it will yield a higher conversion rate at a lower cost. A single short generic key word can deliver thousands of hits to your website a day. In contrast, the long tail key word will not. The key (catch) is to have a lot of long tail keywords and to keep adding content to your website, often. Search engines love fresh updated content, by using blog posts and linking strategies you can easily implement long tail keywords and grow your website’s reach. Finding keywords involves research, lots of it. A good place to start your research is at your competitors’ websites. Check their title tags, the short meta description and whether their site has a well organized navigation – and internal linking structure. Pay close attention to any links and note if they have any keywords in them. You can also use keyword suggestion tools like Google’s Adwords Suggestion tool if you have an Adwords account.